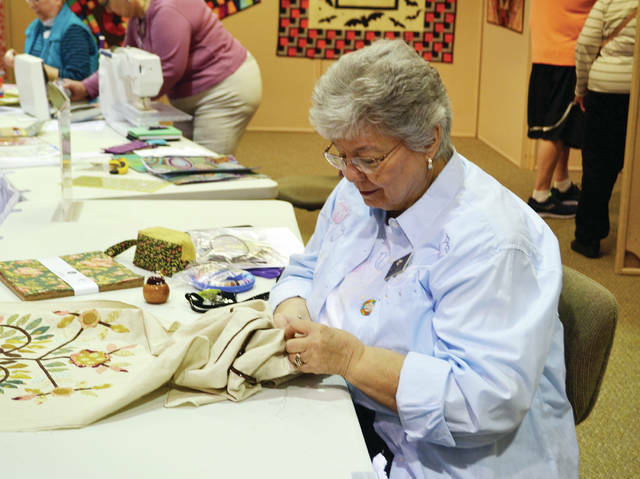 The 43rd Annual Sauder Village Quilt Show will be held May 1-5. Guests of the 43rd Annual Sauder Village Quilt Show, to be held May 1-5, can register now to enter a quilt and to attend the brand new “Schoolhouse” event, lecture, and workshops. “Sauder Village Schoolhouse,” to be held May 3 from 10 a.m.-4 p.m., will include a day of quilting and entertainment to learn about the latest quilting trends, techniques, tools, and technology. Guests can choose from class topics that cover the fundamentals of quilting, technique sessions focused on quilting skills, and product classes. Each session will include presentations by a variety of nationally and locally known educators, artists, and quilt business personalities including Pam Buda, Donna Kooistra, and Electric Quilt Company. Pre-registration is required for the all-day Schoolhouse event. The $49 registration fee includes lunch. Buda will also offer lecture and quilting workshops during Quilt Show week. They include “Colonial Star” and a special lecture, “Secrets of Professional Quilters – Revealed!” on May 1, and “Practice What I Preach” on May 2. Registration is also necessary for “Winners Showcase Preview,” to be held April 30 from 5-8 p.m. The new evening event includes hors d’ oeuvres, a power point presentation of the top winning quilts, an awards presentation, and the chance to glimpse the 2019 quilt show. Workshop/event description, fees, supply list, and registration details are available online. Class sizes are limited. Quilters are also encouraged to register a quilt for exhibition in the 2019 show, and online registration is available for quilt appraisals, to be performed May 2-4; advance registration is preferred. Registration for the Schoolhouse, workshops and lecture, quilt exhibition, and appraisals can be found at saudervillage.org/classes-events/special-events/quilt-show-2019. Again this year, the quilt show will feature a vendor market, quilt exhibition, special exhibits, and a grouping of creative demonstrators. The quilt exhibit in Founder’s Hall is expected to feature nearly 400 quilts on full-length display in categories ranging from pieced, appliqué, and mixed media to art and innovative, masters, baby, miniatures, and youth. A special $11 “Exhibit Only” admission pass is available for the quilt show. The admission price for the show and village is $18 for adults and $12 for students ages 6-16. A two-day admission pass is available for $28 for adults. For more information, call 800-590-9755, visit www.saudervillage.org. https://www.fcnews.org/wp-content/uploads/sites/45/2019/04/web1_sauder-village-quilt-show.jpgThe 43rd Annual Sauder Village Quilt Show will be held May 1-5.